With the rapid growth in vehicle parc and new launches on the way, India’s automotive aftermarket is gearing up with solutions that are both innovative and enduring. Bringing the latest aftermarket advancements from 16 countries, ACMA Automechanika New Delhi will kick off this year on Feb. 14. For four days, the auto component industry professionals will converge at Pragati Maidan in the national capital. Having made its debut in 2013, ACMA Automechanika New Delhi has more than doubled in terms of space and exhibitor growth. The fourth edition which was completely sold out a month prior to the fair, will bring together market leaders and innovators such as ACDelco India, Ample Auto Tech Pvt Ltd, Bosch, Delphi Automotive Systems, Elofic Industries Ltd, Mansons International Pvt Ltd, Minda Distribution and Services Ltd, Him Teknoforge Ltd, Bosch Ltd, Valeo India, ZF India among others. More than 500 companies and trusted brands are expected to showcase an array of solutions in automotive parts & components, electronics & systems, accessories & customizing, repair & maintenance, management & digital solutions and car wash, care & reconditioning. Alongside promoting new innovations, show organizers also will address the need for safer roads and usage of genuine auto parts and protection against product piracy through ACMA’s Safer Drives and the ‘Messe Frankfurt against Copying’ campaigns at the fair. The campaigns aim to underline the need for reliable products to address the rising concerns on counterfeits sold in the replacement market. A closed-door session by All India Automobile Workshops Association (AIWA) also is slated to take place at the fair. 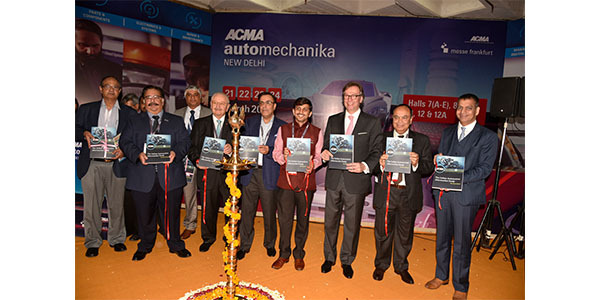 Recognized as one of the most influential events for the aftermarket business globally, ACMA Automechanika New Delhi is one of 17 Automechanika fairs held across Africa, Asia, Europe and the Americas. For more information about these fairs, visit automechanika.com.